Life for fifteen-year-old Nurjahan would probably have remained limited and claustrophobic had she not found Surovi. A domestic helper whose mother is also a maid, Nurjahan has three siblings and her family is too poor to send her to a regular school. But school had always been a place she dreamt of being in and as if to grant her wish, a neighbour at the slum they lived in mentioned the free school named Surovi. When her mother saw how keen she was about going to school, Nurjahan's mother got her enrolled. The teenager has been working for a family in Green Road while studying in the eight standard at Surovi. “I go for private tuition in the afternoon and I study regularly after finishing my household chores. But my employers are not very happy about it and have asked me to find another job. My salary is Tk.800 and I've to pay Tk.500 for private tuition per month. The remaining money I use for buying my clothes, notebooks, guide books, pen, etc. I don't want to stop my education at any cost. Because, education is the only mean to survive, it gives me glimmer of hope and it would mean food on the table,” she explains. Banu, 14 years old, is another teenager with simple dreams: to live a decent life. But being poor she has had to keep her dreams on hold. She is a domestic worker in a house in Dhanmondi and all she wants is to study so that she can eventually find better employment and hence, a better life. Banu's father divorced her mother when she was a child. She and her mother work in a same house. “My mother and I look after an old paralysed woman and do household chores in the home. We jointly get Tk.1500 per month from this job. When they saw my passion for studying, my employer admitted me in the school. I'm grateful that they have given me this scope to study. After finishing all household work at 10: pm, I can sit to study. Sometimes when she becomes very sick, I cannot come to school,” she says. Among the several NGOs working to educate poor children, Surovi probably stands out as it has, for years, been targeting children who live in slums, many of whom are engaged in domestic work. As education is the basic right of every child, they offer free education to children who are not able to afford to go to school. They have a qualified and self-motivated team of teaching faculty who work hard to teach these children and help them in improving their life standards. Formed in the February 1, 1979, by Sayeda Iqbal Mand Banu, a social worker with a philanthropic mindset. Surovi is a Bengali word means “fragrance”. Surovi, located at Dhanmondi, Dhaka, a non-government and non-profitable organisation is a Bangladeshi NGO that provides education to poor children at absolutely no cost. Sayeda was conscious of the fact that there were many children working in houses for hours on end without any possibility of getting an education. Recognising the fact that it was wrong that children should be deprived of education just because they were so poor that they had to work in people's homes Sayeda established the school with the aim to give these children basic education. When the school began nobody wanted to send their domestic workers to the school. It would take too much time away from work or make them too smart so they would want to leave - these were probably the usual selfish thoughts of the employers. In implementing different activities Surovi follows United Nations Convention on Child Rights as the standard. Micro-credit service is available for all parents of students. Child sponsorship and scholarship programmes are also available. She goes on and states that Surovi plans to expand its activities in every district of the country. We desire that no child in this country should remain neglected, hungry and without the light of knowledge. “Children are the future of the nation,” says Surovi's director Md. Abu Taher. "But few people think of education to underprivileged children. 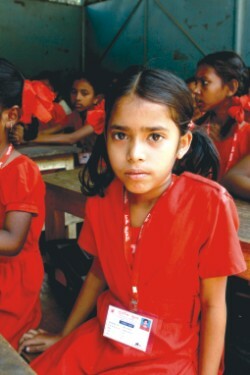 Surovi believes that education empowers these children and helps them to evolve into better citizens. We started this school with an innovative view." Surovi has opened up a new horizon for many deprived children, Photos: Zahedul I Khan. Surovi is committed to ensuring quality primary education through organising pre-school education for children of the poorest families (below 6 years old). Surovi constantly stresses on education and skills development training for the deprived children. They also work for women empowerment as well as they support people in case of natural disaster. Surovi supports the poorest children for continuing higher education through sponsorship and scholarship programmes and helps to mainstream the Surovi graduates to formal schools. Surovi Schools are following curriculum developed by Plan Bangladesh. To reduce student drop out, parents and community people take part in discussion meetings, awareness sessions, workshops and observation of special days which create awareness among them. Surovi has integrated pre-primary education in their schools to support the poorest children to be prepared for primary education and hence reduce the number of dropouts. Surovi stresses on education and skills development training for poor children. The schools are from playgroup to eight standard. There are three shifts in each of the schools. The school authority provides text books, notebooks, bag and uniform to each child. They also teach some extra-curricular activities, like music, art, computer literacy, doll-making, tailoring, etc. 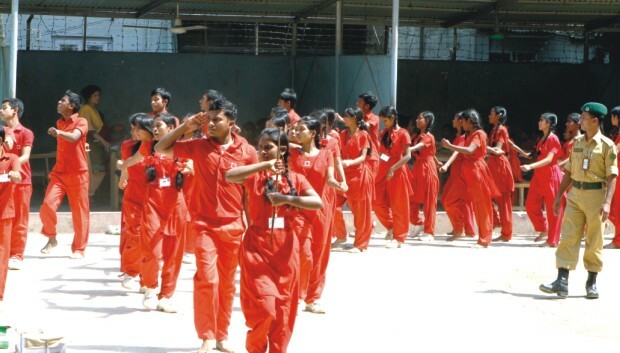 Students attend the training session after school. The doll making and tailoring products are sold to Arong, one of the biggest handicrafts stores in Bangladesh. A part of this income is given to the trainees. 'Surovito Bangladesh' is a special intervention project for the children who are working as domestic help and whose employers have not agreed to let them off to go to formal school. Surovi has taken up a project to set up education centres next to the employer's residence offering flexible timing to its students. This has given many children the opportunity to learn instead of being confined to the houses they work in for hours on end. 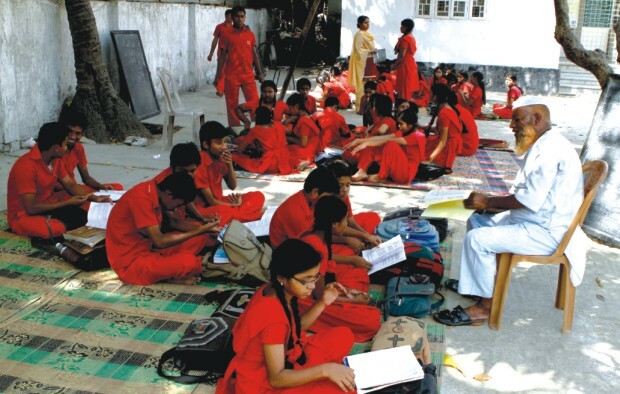 The overall programme of Surovi runs by the support of Government, donor and the school's remarkable founder. There are a total of 1399 staffs involved in different programmes. 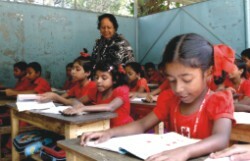 They are running six children schools in the different areas of Dhaka. There are 2380 Children Learning Centres, 1190 pre schools and 1190 Learning camps in 24 districts. Child domestic workers are often the most deprived and exploited informal labour force. While there are UN conventions that would deem such work as completely a violation of human rights, the reality is that in a society like ours where cheap labour is readily available most of its members do not think twice about employing small children or teenagers, paying them a pittance and making them work like grownups. But worse than that, these employers do not think it is necessary to provide the most basic need to a child who is working in their house, the need for education. Thanks to a few members of the privileged society, there is a ray of hope for these children. Surovi, especially, has been at the forefront, leading the way for the rest of society to help children dream of a better future.